ATLANTA (AP) Josh Pastner’s first season at Georgia Tech went much better than expected. The Yellow Jackets had 21 wins. They knocked off North Carolina , Florida State and Notre Dame . They reached the final of the National Invitation Tournament . Most notably, they generated some excitement on campus for the first time in years. Heading into his second season as coach, Pastner knows his program is facing much greater expectations. But, he quickly cautioned, it’s too early to proclaim the Yellow Jackets have turned things around. Georgia Tech hasn’t made the NCAA Tournament since 2010. This transformation will take longer than a single year . The coach is a relentless recruiter, and he knows it will take some big-time prospects to really turn the corner in the mighty Atlantic Coast Conference. He hasn’t been able to land any so far. But the Yellow Jackets are starting to chip away. 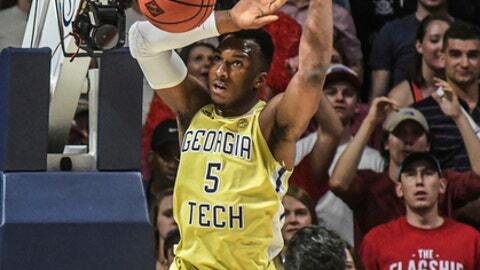 OKOGIE EMERGES: Guard Josh Okogie is the unquestioned leader of the team after averaging 16.1 points and 5.4 rebounds per game in his freshman season. He’s looking to take on an even bigger role. MIDDLE MAN: Lammers was the ACC’s defensive player of the year, leading the team with 125 blocks and a 9.2 rebounding average. Even more notably, he showed a vastly improved scoring touch, finishing behind Okogie at 14.2 points per game. Pastner will be looking for more improvement at the offensive end. FRESHMEN IMPACT: Pastner didn’t land any five-star recruits. That doesn’t mean his four freshmen will be stuck on the bench. Point guard Jose Alvarado and forwards Curtis Haywood II, Moses Wright and Evan Cole are all going to get a shot at significant playing time, looking to follow the lead set by Okogie in his stellar freshman year. 3-POINT SHOOTING: Georgia Tech needs to improve its accuracy beyond the arc to prevent opponents from sagging into the lane, which was a popular way to defend the Yellow Jackets last season. Judging from an exhibition game after cross-city rival Georgia State, that’s still a work in progress. Facing a zone, the Yellow Jackets made only 3 of 25 from outside the stripe in a 65-58 loss. AVOIDING INJURIES: Georgia Tech returns its top three scorers in Okogie, Lammers and senior guard Tadric Jackson (12.1 ppg coming mostly off the bench). They’re a solid nucleus, but the Yellow Jackets are short on depth.